Three months is a long time. A long time in any life, practically a season, and a long time to be away from this space. I didn’t really go anywhere, but I feel like I’ve been on a long journey. Just after I posted the last time, I was told that I needed more chemotherapy. Three more rounds, to see if we could improve the results. That I needed the extra treatments at all was hard news — hadn’t I already done everything humanly possible? — but the treatments themselves seemed to take everything out of me. I thought I’d gotten away without experiencing really severe fatigue, but there I was, having to go back to bed after doing something as simple as making a cup of tea. I went to work, barely, and the stairs up to my apartment became my one goal for the day: could I climb Mt. Everest one more time? But look, here I am, living to tell the tale. I did it. I got the good news about my latest scans on my birthday, and I celebrated by going to the ocean. I had to stay up on the dune because the sand was just too soft to navigate, but I went there, and I had a good cry and a nice time. I’ve been told that I’m brave and strong, and I suppose I might be. But every person who does this, this chemotherapy and cancer treatment, is extraordinary. It’s done quietly, somewhere, every day, by brave people who want to live. I am honored to be in such good company! My knitting has suffered quite a bit these past few months. 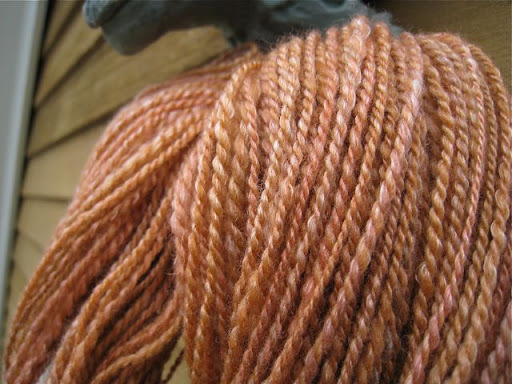 It seems that I did get a burst of energy at one point, because I spun up some Foxfire Cormo/Silk roving. I cast on this little scarf in the middle of March, and worked on it while I was being pumped with toxic chemicals. Before long I had a nice warm springtime scarf, which I wore a lot, since our spring is notoriously slow to show herself. Other than this one little bit, no knitting has been seen in my hands for a long time. I’m still surrounded by it — just the other day I shook the dust off the beginnings of a nice shawl — but I haven’t been inspired to knit. I think that will change soon. My energy is returning, slowly but steadily, and my brain is clearing, along with the blurry vision that was a temporary side effect of one of the chemo drugs. I’m sure I’ll get back to knitting before long — and back to many other things, as well! This is a day to celebrate. I am so happy for you and I look forward to seeing more of your knitting. *hug* Sorry you had to go through that again, but very glad to hear that the results are good! Wonderful to hear from you. Big hugs to you and Annabelle! I am not a knitter but I am a cancer survivor. So glad to hear from you again I think of you and other cancer sufferers every day. I’m hoping that you will recover soon and get your strength back. God Bless and keep you in His Gentle Hands. Happy to have you back–though I never felt you were far away. It really struck me when you said that chemo is done quietly and everyday by people. I think that’s something we all need to remember. I’m glad you’re back and hope you continue to grow stronger. I’m sorry to hear about what you’ve been going through. Welcome back, and hope you continue to get better. I’ve missed your blogs and thought of you often. You are my HERO!!!!! Keep Well!!! You’re in my thoughts! Keep on truckin’. Its good to see you back! May the road ahead be much easier. What a wonderful thing to find you had posted, thankyou. Best wishes from here, and looking forwrds to sharing more fab stuff with you via your blog.Take much care.J. dear, sweet Jane – so many hugs go out your way!More birthdays is indeed a grand thing to celebrate!! And I will be doing the happy dance in your honor out here on the other coast.Such beautiful spinning you have done – and your scarf a gorgeous testimony to your courage.It’s wonderful to see you here again – your gorgeous photos, and the good news of your improving health. I’ve missed you. Hello Jane! Seeing your pictures and your words makes me smile. I value your eloquence and honesty and insight. You are right, every day somewhere in the world, a quiet host of brave people with a desire to live do exactly what you’ve done. I appreciate the reminder.And what exquisite poetry, your spinning! A perfect match of worthy materials and worthy hands.Welcome back into the sunlight, dear Jane. Hooray Jane! So good to see your post and your good news. It’s great to see you back, and with such good news. Congratulations! I’m so glad to see you back. I may not personally know you but I was worried by your absence. My best friend was diagnosed with inoperable pancreatic cancer a year ago and is still fighting the good fight and I am so proud of him! And I am proud of you and hope this is the last of the treatments and you can go on living your life as you want. I am SO glad you’re back! 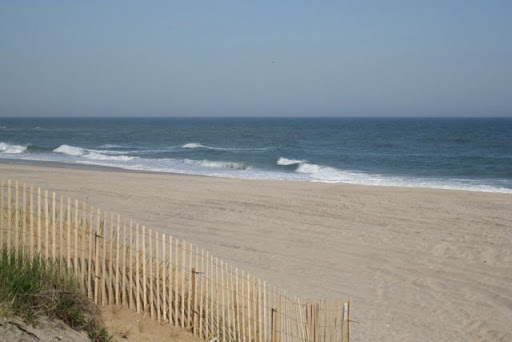 And so glad that you received good news after the latest bout of treatment, and that you got to the beach and also that you had a good cry – that in itself is healing.L’chaim, sister! L’chaim! Wonderful, wonderful news! I’ve been peeking in every week or so just to make sure I didn’t miss a post from you. Welcome back! Here’s to climbing Everest in whatever form, and many more birthday dinners. I have been checking your bookmarked blog every few days, scanning it hopefully for a new entry–this one has made my day. It is lovely to have you back, see your photos, and read your exquisite writing. 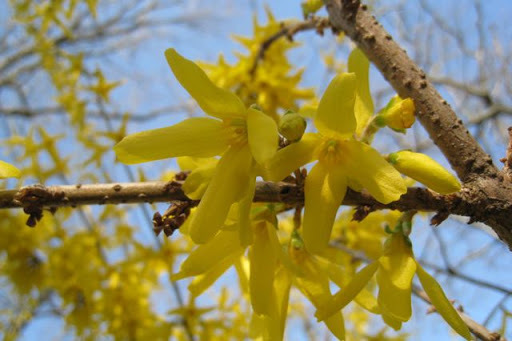 I hope that you are as rejuvenated as our earth in spring. Blessings. Jane – Happy belated birthday! I am happy to read your good news. 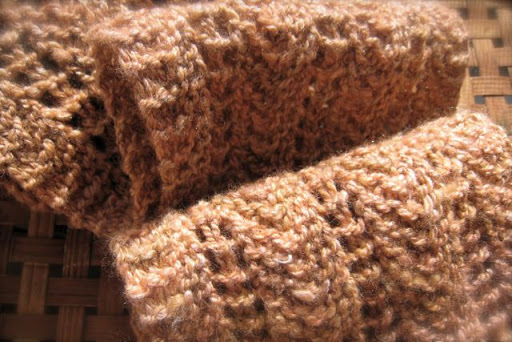 Love the color and texture of your scarf, I bet there will be more to come! What a great bday gift! Glad to see you back. Happy belated birthday, and many, many more! Thank you for fighting the fight, Jane. Congratulations Jane on this birthday and all of the many birthdays to come. You are an inspiration to so many. And don’t worry, you’ve got plenty of time to get back up to knitting speed before the KR retreat! I am so far away from you. Yet I kept hoping to read your post. And here it is! You are an inspiration. Rock On!